The Santa Maria Valley Railway Historical Museum was entry No. 66 in the annual Elks Rodeo Parade. A 30-foot trailer carried a 1/8 scale Pacific Coast Railway (PCRy) train headed by a Pacific Coast electric locomotive. The consist included a PCRy boxcar and a passenger coach. Riding on the float were Cub Scouts from Pack 93, Den 3 that had visited the Museum last Fall. Thanks to Grekka Energy for the trailer, the SMVRR for a dozen ties, and to the BCWRR for 30 feet of 7.5-gauge rail and the train itself. We're all pretty convinced that Dan was born to do this stuff! Ride the very same train the following Saturday, June 8th, at the SMVRHM's second annual Choo Chew Saturday at the Bitter Creek Western Railroad. 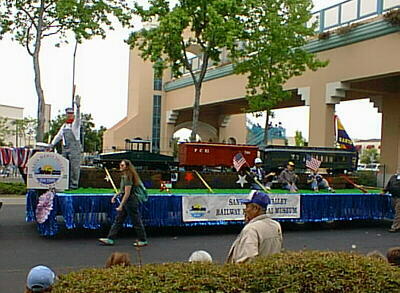 At right, the SMVRHM crew prepares the grade on the flatbed truck the day before the parade, building it up using railroad ties from the SMVRR. The track was then placed on top of the railroad ties (below left).